Solid Wood Platform Bed and Bedroom Furniture Seattle - Dapwood Furniture Co.
Seattle, the Emerald City, known for its lush evergreen forests was Americas first timber city. 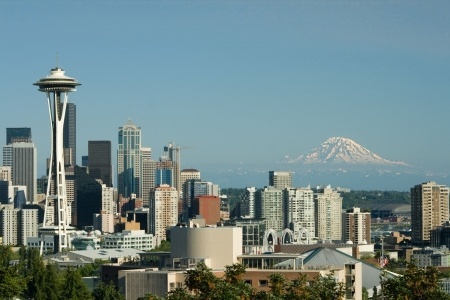 Today it is better known for its high tech industries but Seattleites still know their roots and enjoy the gorgeous scenery surrounding them. Dapwood has been crafting healthy and eco friendly solid wood furniture for 30 years making us the ideal choice of Seattleites and Washingtonians who value their environment and seek toxic-free sleep. Our simple, clean designs showcase the beauty of nature because no man made materials can rival the unparalleled beauty of solid wood grown in America that is infused with color hues, grain and structural strength. Our unique construction methods allow our platform bed frames and solid wood furniture to ship flat (via Fed Ex Ground) and assembles easily with only a screwdriver and rubber mallet. And when it’s time to move, all designs disassemble and reassemble with the same ease. Each Dapwood Bed is an original- hand crafted to your exact specifications. We don’t take components from the shelf but rather plane, join, sand, route and fasten all bed furniture to order. And when it’s done, we apply natural finishes by hand. You are not only guaranteed a work of art but the finest platform bed and furniture available at any price. We invite Seattle to Rest Easy since a Dapwood solid wood platform bed will provide you with the healthiest night sleep you can find. Rest easy knowing that when you purchase a Dapwood platform bed frame or bedroom furniture, you have acquired the most environmentally friendly product available. At Dapwood we understand that we need to do more to protect our environment for the future. That is why we work tirelessly on sustainability and are a certified B-Corporation. We don’t talk about being eco friendly- we live and breath it every day. If you are tired of your furniture containing industrial chemicals and made in some far off land, check out Dapwood. You will sleep better if you do.